Winner of the 2011 Carol Tambor Best of Edinburgh Award at the Edinburgh Fringe Festival, LEO: The Anti-Gravity Show comes to Asheville for two nights, Friday and Saturday, March 28 & 29, 2014 at 8:00 p.m. at Diana Wortham Theatre. LEO is a mind-bending, funny, surreal and surprisingly touching show that challenges the senses with the question, “What would happen if the laws of gravity were to suddenly change?” With a clever interplay of live performance and video projection, “LEO is a little eye candy for the jaded gaze.” (The Village Voice). LEO is the unusual journey of an otherwise ordinary man whose world becomes physically unhinged. 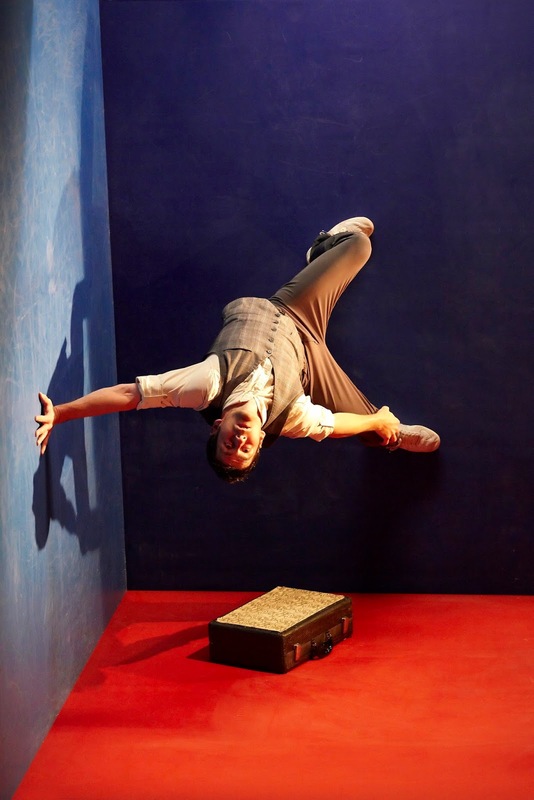 In this witty, one-man show of acrobatic physical theatre, Leo lives at a ninety-degree angle to the rest of the world. With fluid, real-world handstands, tumbles, and falls projected by an ingenious video stage concept, the simple act of standing up is transformed into a stupendous feat, while walking up a wall becomes the most effortless and natural event. Directed by Montréal actor and director Daniel Briére and based on an original idea by the multi-talented performer Tobias Wegner, LEO has made its way around the world with performances from New York to Berlin and from Melbourne to Hong Kong with stops in Montréal, Moscow and London along the way. In addition to the 2011 Carol Tabmor Best of Edinburgh Award, LEO’s awards include the Three Weeks Editors Award and the Scotsman Fringe First Award at the Edinburgh Fringe Festival. The show also won the John Chataway Award for Innovation at the 2013 Adelaide Fringe Festival. The performance has been brought back to the Edinburgh Fringe Festival an unprecedented three times with runs in 2011, 2012 and 2013. “Leo, in his little rectangular box…makes us laugh, astonishes us, turns us around and lifts us up. LEO is a work that is rich, intelligent and luminous…LEO will make us all forget about Newton. And what a fascinating world it will be” (Le Devoir, Montréal). LEO leaves audience members wondering which way is up and which way is down, but always on their feet. LEO: The Anti-Gravity Show is also a part of the Matinee Series for Students and Families, with a performance on Friday, March 28 at 10:00 a.m. The Matinee Series is open to school groups, homeschoolers, community groups, and families. LEO: The Anti-Gravity Show’s Asheville performances are funded in part by a grant from South Arts in partnership with the National Endowment for the Arts and the North Carolina Arts Council; and by Mainstage Theatre Series Sponsors Carol & Bob Deutsch, Bill & Jerry McAninch, and Bank of America; with additional support from Media Sponsors WCQS 88.1 FM and WNC magazine. The Matinee Series for Students and Families is sponsored by Duke Energy and the North Carolina Arts Council. The new entrance for the Diana Wortham Theatre at Pack Place is marked by the location of the theatre’s new marquee between 12 and 14 Biltmore Avenue. Patrons enter the theatre through the breezeway next to Marble Slab Creamery, and into a large interior courtyard for Pack Place with multiple glass doors to the theatre’s lower lobby and new box office. The intimate theatre seats just over 500 and boasts exceptional acoustics and sightlines, making it the premier performance space in Western North Carolina. The Mainstage Series is supported by a grant from the North Carolina Arts Council, a state agency. The Mainstage Series 2013/2014 Season Sponsors are the Asheville Scene, Blue Moon Water, Creative Energy, Laurey’s Catering and Gourmet-to-go, the North Carolina Arts Council, and the Renaissance Asheville Hotel. To obtain more information on the Mainstage Series or to purchase tickets, call the theatre’s box office at (828) 257-4530 or visit www.dwtheatre.com.